David Tennant visited Uganda in November 2010 to record a film about the work that Comic Relief is doing there. It was screened on BBC1 on Red Nose Day (Friday 18th March 2011). 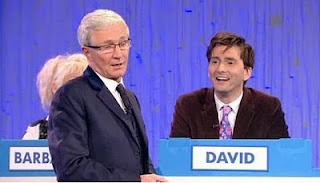 On Saturday 5th March David Tennant appeared on two programmes during 24 Hour Panel People online. The website for Comic Relief is here. Posts on Blogger related to David Tennant on Comic Relief and David Tennant on Sport Relief.